Thu, Mar 7, 2019, 12:12 pm SL Time, ColomboPage News Desk, Sri Lanka. Mar 07, Colombo: Sri Lanka, as one of the largest tea producers in the world and being aware of the industry's contribution to global warming, is seeking to reduce its carbon footprint and foster sustainable practices in the tea industry, Sri Lanka's top envoy to the UN said. 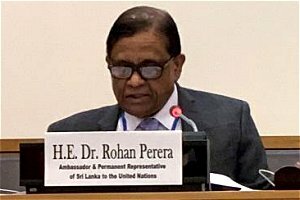 Dr. Rohan Perera, Permanent Representative of Sri Lanka to the United Nations in New York delivering the opening remarks at a side event on efforts to reduce carbon footprint said Sri Lanka attaches great importance to the crucial issue. The Permanent Mission of Sri Lanka to the UN, along with the Permanent Mission of Kenya, co-sponsored the event entitled "Race to Zero Carbon" held Wednesday (March 6th) at the United Nations Headquarters. This event, which was organized by NGOSustainability, focused on the efforts to reach a zero carbon emissions world in the future. Describing the steps Sri Lanka has taken in the race towards achieving zero carbon, Dr. Perera said Sri Lanka has been acutely aware that agricultural activities are a key contributor towards global warming and the island nation is no stranger to the impacts of climate change, such as floods, droughts and cyclones, which have had a tremendous impact on the people and economy. "We are 4th in the Global Climate Risk Index for 2018. The annual losses due to climate induced disasters were estimated at 1,623 million USD in 2017," he noted. "Like Kenya, we are one of the largest global producers of tea. This is an area where Sri Lanka is seeking to reduce its carbon footprint and foster sustainable practices in our tea industry." Dr. Perera said Sri Lanka is adopting organic cultivation, moving towards the zero use of fertilizers, weedicides and pesticides. "Steps are being taken to prevent soil erosion in tea plantations, conserve the utilization of water, promote re-forestation and encourage tea factories to adopt eco-friendly processes,"
The Ambassador noted that as a tropical island located in the Indian Ocean, Sri Lanka also has enormous potential for renewable energy such as solar power, wind power and hydropower and is seeking to reduce the dependence on fossil fuel for energy. He said Sri Lanka is increasingly adopting renewable energy sources and has built several wind farms, solar power stations, wind power stations and biomass power stations across the country. The most successful and widespread have been hydro power, with a number of large scale and mini hydro projects. In addition to the government, the private sector too is playing an important role to reduce carbon emissions. "Combatting climate change and global warming is a collective global effort. Sri Lanka is party to key multilateral treaties relating to climate change, including the Paris Agreement and the UNFCCC, and we are steadfast in our commitment to the obligations flowing from them. We will continue to support all international initiatives to reduce our carbon footprint on this planet and build a sustainable world for the future generations," the Permanent Representative said. The event featured presentations by Dr. Chuck Kutscher, Fellow and Senior Research Associate at the Renewable and Sustainable Energy Institute, University of Colorado-Boulder, and Ms. Romany Webb, Senior Fellow at the Sabin Center for Climate Change, Columbia University Law School.